Lost in the mix of Wednesday night’s final installment of “UFC 166: Primetime” was the debut of “Countdown to UFC 166.” Yeah, the shows are starting to seem redundant to me, as well. Although, the primary difference between the two documentaries is that Countdown includes segments on a card’s co- and co-co-main event (is co-co-main event a word?). Whereas Primetime focuses solely on a show’s featured attraction. 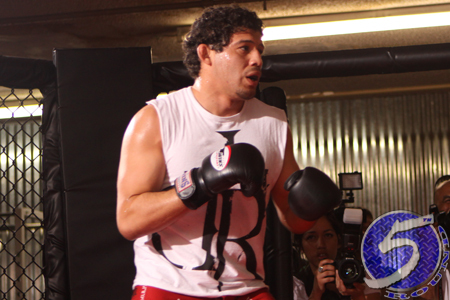 This particular Countdown episode featured heavyweight champion Cain Velasquez and Junior dos Santos – obviously, since they are headlining UFC 166 – bitter rivals Daniel Cormier and Roy Nelson and lightweights Gilbert Melendez (pictured) and Diego Sanchez. Guess who’s got the footage for you? UFC 166 takes place Saturday night inside Toyota Center in Houston, Texas.